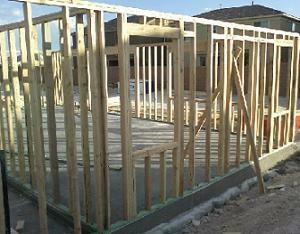 Framing a window or window and door framing is part of wall framing. In fact exterior stud walls cannot be built without proper framing of windows and doors, which is part of framing a house. 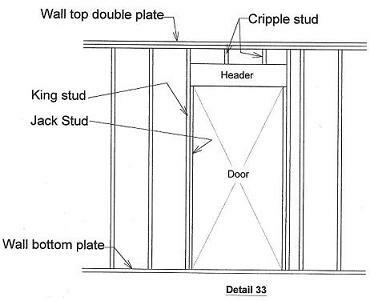 Since the openings for windows and doors interrupt the stud arrangements within walls, it is critically important that the strength of the wall is not compromised. Exterior stud walls of any given building serve two purposes that benefit the structure itself - one to support loads from floor(s) and roof above, second they provide stability for the structure via shear walls. While framing a wall or framing a bay window, it is very important to keep these two very important stud wall distinct purposes in mind. Keeping the house’s occupants comfortable is another function of exterior stud walls but this function only benefits the occupants but is less beneficial to the structure itself. This occupant comfort does contribute to the size of studs whether 2x4 in warm climate areas or 2x6 in cold weather areas. 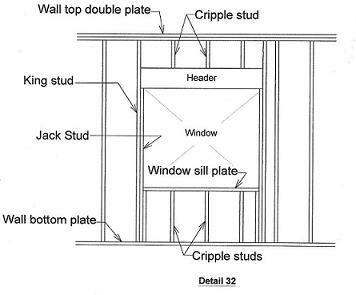 he best way to illustrate how exterior walls contribute to the lateral stability of any house is to shake from left to right stud walls such as details 32 and 33. As you push it is very visible how unsteady stud wall is and it does not matter how many nails or how many studs installed, the wall will be shaky. After installing the wafer boards on the wall, try pushing on the wall again – you will see and feel that the once shaky wall has become very stiff. This effect of adding wafer board or plywood to the stud wall is what is called shear wall which stabilizes the house or building. As the studs are cut to allow windows and doors to be installed, not only the vertical strength is compromised, the lateral ability of the wall to transfer loads laterally is severely interrupted too. These problems led to details 32 and 33 which provide vertical strengthen to support floors, roofs, and other walls above. These details also transfer lateral loads due to wind storms and earthquake. The headers are are designed as beams which are capable of carrying the load from floor or roof above thru the Jack and king studs down to foundations and footings. There are lots of framers who use double King studs in lieu of a king and Jack studs as shown. The problem with double King is the load will be carried solely by nails, much weaker than having a Jack stud carry the load.